Win it! 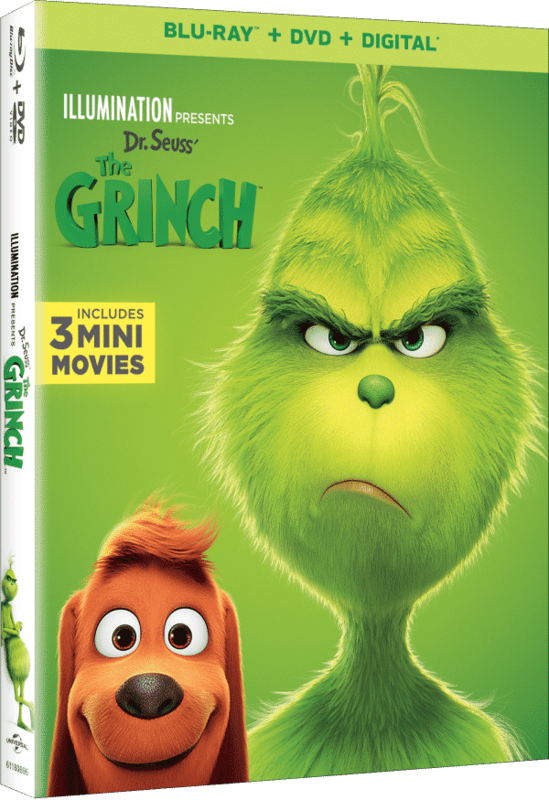 In celebration of today’s February 5th release of THE GRINCH DVD, we’re giving away copies of the brand new DVD along with adorable little Grinch plush beanies! 3 lucky winners will be chosen. Check out the entry details below! My kids absolutely loved this movie – a fabulous update to the holiday classic Grinch tale with lots of messaging about kindness… the world needs so much of this right now! Illumination and Universal Pictures present The Grinch, based on Dr. Seuss’ beloved classic. The Grinch tells the story of a cynical grump who goes on a mission to steal Christmas, only to have his heart changed by a young girl’s generous spirit. Funny, heartwarming and visually stunning, The Grinch is fun for the whole family! Eligibility Details: Giveaway is open to all US Residents, age 18+. Must have a US Mailing address. My granddaughter loves the Grinch! I can’t wait to check out this version of the movie. Looks good. My son loves The Grinch so much!! we bought him The Grinch pajamas and he wants to wear it to sleep every night!! We really want to see this! Dr Seuss rocks. Thanks for the giveaway. Would love to win this one. Such a cute movie! I loved this movie as a kid and now my grandsons love watching the Grinch! I would love to win this one for the kids in the family. Mark loves that little guy. Would love to win for him. Looks like an awesome movie! Thanks for the opportunity to win. It would be great to win! Fun for the whole family! i love the grinch! he rocks! I would like to watch this Grinch movie with my daughter! I love the Grinch and can’t wait to see this movie! I love the Grinch so much always have ever since I was a child. My son and I both want to see this movie. We’d love to win! Thanks! My family would love to watch this for movie night! Thanks for the chance! Hope you are having a nice Friday, sure would love to win this one thanks for the chance we love the Grinch. This prize would be fun for our family – grandkids LOVE to have a picnic while watching a movie with us! I would love to see the 3 mini movies, too! My daughters would love to own this movie. My grandchildren will really enjoy watching this. It’s a winter wonderland here today lots of snow. We love the Grinch fingers crossed to win this one. I didn’t get a chance to see this at the movies. Fingers crossed to win, looks like a great movie! I think this version of The Grinch will be awesome! Followed on youtube: Donna B.
I love the original with Boris Karloff! I want to see this movie!!! Hope you are having a nice Sunday it sure is cold here in my neck of the woods. I would love to share this movie with my son. Last day to enter! Hope I win! Would love a chance to watch this. My kids would like the plush beanies, too! This looks like a fun movie to watch with my son! I love the voice cast for this movie! I so enjoyed the original with Boris Karloff! My kids have been wanting to see this. I would like to win so that I can watch it with my grandchild. Getting ready for Valentine’s Day this week is just flying by. We love the Grinch so much. My 3 kids would really enjoy seeing this movie. I follow your Facebook page (Hesper Fry). I’d love to win this prize for my family, because we haven’t seen this movie yet. This would be a great gift for our family for Valentine’s Day! My littles loved this movie! It sounds like a great movie for the family. Would be great to watch with the family.